Speaking with a friend just before Christmas, our conversation turned to what we were each reading. “It’s depressing, isn’t it? ?” she cried. I was relieved; I’d thought that my morning sickness had been the only reason I’d been struggling to find anything endearing about this novel. 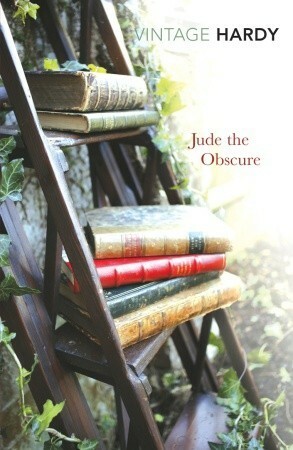 Jude the Obscure is a depressing story. Any moments of joy Hardy has thrown in are quickly tempered by tragedy, which makes for a compelling but gloomy read. From what I’ve gathered, Hardy was one for making his feelings about aspects of Victorian society well-known through his writing. This is certainly evident in the themes running through Jude the Obscure; he is rather blatant in his commentaries of class boundaries, religion and the institution of marriage. At the time of publication (1895), the novel was heavily criticised and even publicly burned by one English bishop. Jude Fawley, a young orphan, aspires to be a university scholar. He spends his spare time studying Latin and the classics, and firmly believes that his lack of money will be off-set by his intelligence and enthusiasm. He is tricked into marrying a local girl, Arabella. Arabella is vain, and mocks Jude for his studies; Jude in turn scorns Arabella for her trickery, and after two years, she leaves him. Jude then sets out to follow his university dreams in a nearby city, but is disheartened to learn that his passion for learning is not enough to see him admitted into the university. He is poor, and of the wrong class of society, and no amount of knowledge is going to change this. While earning his living as a stonemason (and still hopeful that one day he will fulfill his dreams), he meets and falls in love with his cousin, Sue Bridehead. Sue resists Jude’s pledges of love and marries an older gentleman, but is desperately unhappy and finds her husband physically (and therefore sexually) repulsive. This combined with her love for Jude sees her convincing her husband that he should free her from their union, and he agrees – his love for her is so great that he would rather let her go than see her stay and suffer. Sue and Jude begin to live together in a non-sexual relationship; both are resistant to the idea of marriage in part due to each previous failure, but also because their family has a history of tragic unions. However, Jude eventually convinces Sue that they can have a sexual relationship and live together as a “married” couple without making it official, and they have two children together. They also become instant parents to a son from Jude’s marriage with Arabella; a son he did not know existed, as Arabella had not been pregnant long when she left him. The family are socially ostracised when it is discovered that Sue and Jude are not legally married. A tragedy that befalls the family sees Sue turn to Christianity; she has previously been indifferent to religion, but is now convinced that the tragedy is divine punishment for her and Jude’s actions, and throws herself completely into the church which has previously ostracised her. Hardy himself was unable to attend university for financial reasons, and his own wife turned to the church as she got older, causing increasing issues in their own marriage as Hardy was always highly critical of organised religion. I don’t think the novel was intended to be a biographical piece, but it is interesting to see Hardy using it as a very obvious sounding-board for his own thoughts and feelings. I found this novel to be too depressing to be enjoyable, but there was something compelling about it that had me persevering until the end. I won’t lie – I breathed a sigh of relief when I read the last page – but I think the sporadic moments of happiness and lightness are enough to make this a novel I’m glad I read….I would just recommend you tackle it on bright sunny days, when you have enough moments of sunshine and happiness in your own life to ensure this novel doesn’t bring you down! I just finished A Prayer for Owen Meany and Irving directly references Hardy a lot and Jude the Obscure especially. I feel like diving into this one straight away, but it is cold and gloomy in our neck of the woods so might put it off till summer!